Feeling irritated? Like you need some nurturing? This ojas building herb is renowned for its affectionate side. Whether you have a digestive tract that's gone haywire, a dry cough, or are in need of nurturing, this herb mothers you back to health. 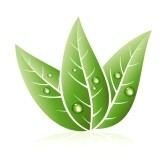 Shatavari is popularly known as a nature's premier women's health herb, but it is so much more. It is a nourishing, sweet herb. It moisturizes your body. As an anti-inflammatory, it soothes burning sensations. Perhaps best of all, it is antimicrobial, making it useful for candida and dysbiosis in the gut. There are very few nourishing antimicrobials. Shatavari is thus a gem to those who have been depleted and exhausted by chronic bacterial overgrowth in the gut. Many love to pamper themselves with this pleasant, nurturing herb! Shatavari is ideal whenever there is dryness and burning. One client testifies to its cooling nature: "I wake up a little bit colder [when taking shatavari]. My temperature is 97.6 degrees, for example, rather than 98.3 or 98.6. I feel a bit colder during the day." Shatavari is often the first choice in Ayurveda for inflammation in underweight, Vata individuals (including Vata pushing Pitta conditions). Clients report feeling calm and comforted by this easy-going, nurturing herb. One client writes, "My whole body felt relaxed." In anxiety relieving formulas, shatavari is commonly paired with dashamoola, brahmi, ashwagandha and shankhapushpi. Shatavari is estrogenic, helping to replenish and balance depleted estrogen. It is commonly used in menopause or perimenopause, or whenever estrogen levels are low. 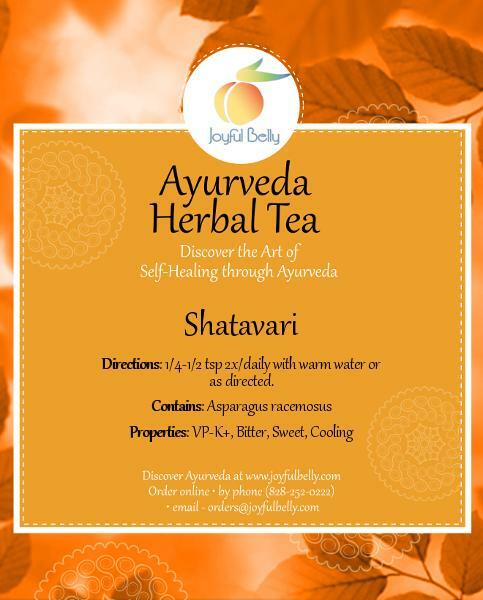 Shatavari is a galactagogue, meaning it increases the flow of breast milk. To this effect, serve in warm milk with ghee, fenugreek, fennel, and/or ajwain. Shatavari also benefits the male reproductive system as it increases sperm count and purifies sperm. Shatavari moisturizes membranes, including the lungs, digestive tract and female reproductive organs. As a female aphrodisiac, it is especially moisturizing, helping dispel low libido due to vaginal dryness. Its name means "she who posses 100 husbands," testifying to its aphrodisiac qualities. Shatavari ghee may also be used topically for vaginal dryness. It is one of the few gentle antimicrobial herbs, making it useful for dysbiosis in weakened, underweight individuals (Vata). In addition to suppressing fermentation in the gut, Shatavari cools inflammation and burning in the lower abdomen. One client notes, "It is like pouring water on a burning area. It went right to my pelvic area and became like a mother to that area." Another notes that shatavari, "felt soothing," and that it "coated my entire digestive tract." One client states, "I had been suffering with some hyperacidity for a couple of days with a burning feeling inside. Shatavari really seemed to help to ease it." For a sweet herb, shatavari is surprisingly bitter. It has been traditionally used with herbs such as amalaki, licorice root and aloe vera in a base of pomegranate juice for soothing intestinal inflammation in ulcerative colitis and Crohn's disease. Shatavari's moisturizing and anti-microbial properties help alleviate dry, hard and rough constipation with stools that resemble rabbit pellets. This type of constipation is often secondary to dehydration and fermentation in the digestive tract, which cause a build-up of metabolic waste (ama). Shatavari reduces this fermentation. One client notes, "My elimination was easier, smoother. Stools were not liquified, but well formed and soft." As a cold, antimicrobial diuretic, shatavari is useful to clear urinary tract infections. One client reports the effect of shatavari on her kidneys. "My kidneys felt good and didn't have any pressure," she explains. Several clients also noticed less sweat with shatavari. Shatavari's moisturizing, antimicrobial and anti-inflammatory properties address the root cause of a sore throat due to deficiency. It is especially useful for soothing a dry cough and heat conditions of the lungs. For these cases, use with licorice root and honey. One client noted, "My throat was moist and relaxed, my chest felt a little heavier." Another notes of the cooling effect of shatavari on their upper body: "My shoulders and skin felt a little chilly." Shatavari's cooling effect on the blood (rakta dhatu) refreshes and cools the eyes, as it does all highly vascularized organs including the female reproductive tract. One client notes, "While taking Shatavari the most remarkable thing happened. During the beginning of the week I was really struggling in the first half of the day to have clear vision. I would wake up and everything was blurry (not my normal) and it was like I had oil in my eyes or something. It was very strange. I was straining to see the computer screen etc., All of a sudden I noticed that later in the week I wasn't struggling with that any more and my eyes felt relaxed and my vision was MUCH improved." 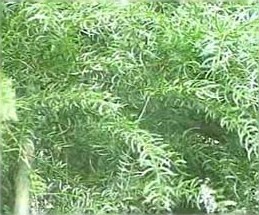 For fever, shatavari is traditionally used with neem and other bitter herbs. For building and strengthening muscles, shatavari is commonly paired with bala (external use only), ashwagandha, ginger, and turmeric. For building ojas, it is commonly combined with vidari. Milk in general is a good carrier (anupan) for shatavari. Shatavari is contraindicated for cold digestion and all cold conditions. One client notes, after eating it, that, "I did not eat until 2pm but did not have a sense of hunger either." One client notes, "I would recommend taking it at midday because it is heavy for me when i take it at night." Shatavari is estrogenic. Do not use shatavari in estrogen dominant women. If you notice tenderness or lumpiness of the breasts during menses, discontinue use. Shatavari may be beneficial for these symptoms. The suitability of any product for a condition is highly dependent on the individual. Please see your doctor before using this product to treat a medical condition. I love this stuff! I'm a Pitta-Vata mix and this is very soothing for me. I didn't like the taste at first but now I've come to really enjoy it. Do not use cool water; it should definitely be warm (I made that mistake). I use a mini whisk to stir and it gets a little frothy. Great for cooling the body! I'm so happy I tried shatavari. It has alleviated menopause-related hot flashes that were keeping me up at night. It took about a week for me to feel the effects, and after 2 weeks my symtoms were completely under control. I just mix a bit in water or coconut water and take it as a supplement. The taste doesn't bother me. Thank you, Joyful Belly!